Luang Poo Thuat amulets are all very well proven. Many temples like to create Luang Poo Thuat amulets, but the problem lies in the amulets whether how effective are they, depends on the monk who chanted them. Luang Poo Thuat's amulets which was created by Ah Jahn Nong, followed the same method used by Ah Jahn Tim; before the actual day of chanting, 9 famous monks would be invited to bless the amulets thorughout the night. The triple gems will be invited to enter the amulets. 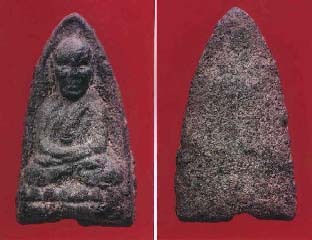 The second batch of amulets created by Phra Ah Jahn Nong was in 2514, after Phra Ah Jahn Tim has passed away. This batch of amulets was created to raise fund for the making a buddha statue in the main shrine. The most venerated monks participated in the ceremony of Buddhist consecration. 1. Pra Khru Sathaphon Buddhamanta (Luang Pho Sam Niang) of Wat Weluwan, Nakhon Pathom. 2. Pra Khru Sathorn Phatthannakit (Ah Jahn Wat Sadet), Pathum Thani. 3. Pra Khru Phisan Phatthanakit (Ah Jahn Rod) of Wat Pradu. Nakhon Si Thammarat. 4. Ah Jahn Nam of Wat Khuan Khanun, Phatthalung. 5. Ah Jahn Mun of Wat Khao Daeng. Phatthalung. 6. Pra Khru Phiphat Sirithorn of Wat Ban Suan, Phatthalung. 7. Pra Phisahn Tamarangsee of Wat Khuha Swan, Phaffhalung. 8. Pra Khru Palat Chieng of Wat Khok Yam. Phatthalung. 10. Pra Khru Palat Nong Dhamabhuto Wat Sai Khao. Pattani. During the chanting on 3rd January BE2514, it was claimed that Luang Poo Thuat came and entered the body of Ah Jahn Mun, but Ah Jahn Mun was not awared. Pra Pisahntamarangsee who was seated beside Ah Jahn Mun was awared that somebody has entered Ah Jahn Mun's body. He asked "Who are you?" Then a voice from Ah Jahn Mun replied that "I am Luang Poo Thuat Yeub Num Talay Jeud" after which he told Pra Pisahntamarangsee to continue with the chanting. Before the chanting came to an end, Luang Poo Thuat instructed Pra Pisahntamarangsee to asked all monks to chant the Kathah Gamawahjah and Kathah Dab Tiang Chai (a chant to extinguish the candle), and he also specified that Luang Por Samnueng to be the monk to extinguish the candle. Pra Pisahntamarangsee asked Luang Poo Thuat in which way this batch of Luang Poo Thuat are useful for. Luang Poo Thuat answered that this batch of amulets are good in preventing accidents, metta mahahniyom and Najangngang (attractiveness). There are 2 types of amulets in this batch of amulets; first type was created by hand is called Pim Yai Neua Wahn(only Pim Yai) and the second type; Pim Yai and Pim Lek Neua Wahn created by machine. There were many moulds of 2 kinds and 2 substances. There was only a large mould but various blocks. They were all Wahn substances. 3. The mould of Yamakapatihariya. Luang Poo Thuat amulets chanted by Ah Jahn Nong are similar to all the Luang Poo Thuat amulets chanted by Ah Jahn Tim because both Ah Jahn Nong and Ah Jahn Tim were very close friends and Ah Jahn Nong also took part in most chanting of Luang Poo Thuat by Ah Jahn Tim. Thus, the effectiveness of Ah Jahn Nong's Luang Poo Thuat amulets are similar. Especially this batch of BE2514 Luang Poo Thuat amulets is very special because each amulet has a Narai Pleung Roop Dtagrut inserted which is very good for metta mahahniyom, protection from danger. This Dtagrut can help to prevent black magic and evil spirit. If someone want to harm you, it was claimed that this dtagrut could change your form and avert the danger, that is why this dtagrut is called Narai Pleung Roop (change form). When Ah Jahn Tim was alive, Ah Jahn Tim also carried this Dtagrut in his bag, and had always mentioned that if one wants to be safe, can go and ask for a Dtagrut Narai Pleung Roop from Ah Jahn Nong.